It's the best time of the year to be a basketball fan. There are about three weeks of non-stop games on the horizon as March Madness kicks off this week. That means lowered productivity at work and friends gathered around a spread of chicken wings and beer. Whether your team is in the tournament or not, there are loads of offers available for basketball fans (and people who pretend they like basketball for a good deal). You'll find cheap eats from places like Buffalo Wild Wings, Wendy's, Domino's, Taco Bell, and other restaurants across the country. Here's a list of the best offers you can find throughout the 2019 NCAA Men's Basketball Tournament. The deal: To celebrate the start of March Madness, Pizza Hut is offering half-off all menu-priced items. The deal: Use the app to get a $1 Junior Bacon Cheeseburger through March 19. Or you could order at least $10 worth of food through DoorDash, use the code "FREEBIGGIEBAG," and you'll get a free $5 Biggie Bag, which includes a Bacon Double Stack, a four-piece order of nuggets, small fries, and a small drink. The deal: Buy at least $20 worth of pizza after signing up for the Papa Rewards program and PJ's will drop a free large two-topping pizza in your account. The deal: Take half off a medium deep dish pizza when you order through Grubhub. Plus, you can get free delivery from March 22-24. The deal: Get free delivery through Grubhub if you order at least through $12 worth of food. Available in select markets. The deal: Why wouldn't the pizza chain associated with LeBron James have a deal around March Madness. Every order of at least $10 placed through the app or website will be delivered for free. The deal: The restaurant is launching four new wing flavors: dry-rubbed ranch, tequila lime, old bay, and Nashville hot. To kick off the fun for March Madness, you can get buy-one-get-one-free orders on the new flavors with the code "249-238-711." The deal: Get $5 off orders of at least $25 when you order through Grubhub. There's nothing that screams "sports party" like wings. The deal: Order one of the restaurants three signature dishes -- wood-grilled Chicken Bryan, savory Chicken Marsala, or creamy Pollo Rosa Maria -- and you'll get a free order of Lasagne to take home. The deal: Ripped from the pages of Weird Food Magazine, Auntie Anne's has a giant bucket of pretzels in the shape of a hoop. The idea is that you can dunk pretzels in sauce, but you know you'll get this and chuck pretzels across the room at the bucket. 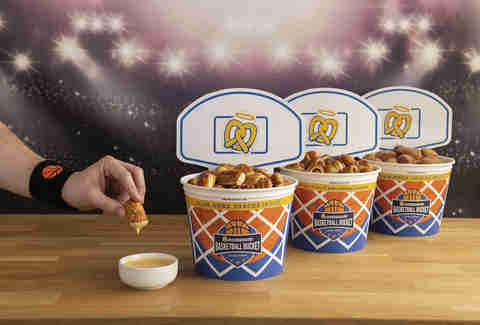 The Free Throw Bucket is $19.99 and the 3 Pointer Bucket Trio (three pretzel buckets) is $54.99. The deal: If it's your first catering order through Metro Diner, congratulations! You get $25 off an order of at least $100 as long as it's for a weekday and placed online with the code "WINTER2019." The deal: Load up on sliders and get free delivery on Grubhub orders in select markets. The deal: To celebrate the launch of its new app, you can get a totally free drink every day in April through the app. The drink will change daily and you can only redeem a drink once per day, but it will be available at all of the chain's more than 750 locations. 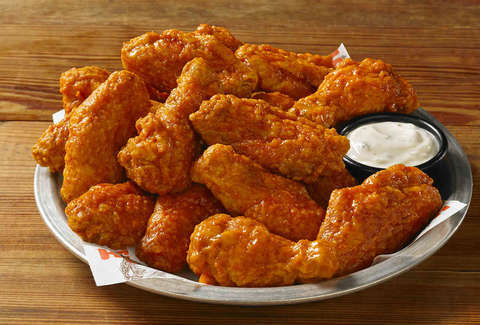 The deal: Order any chicken platter from the catering menu and get a free half order of Big Wings or Jumbo Tenders. Also, on these same dates, draft beers are $2.50 at all locations. The deal: Get free delivery through Grubhub in select markets. The deal: Select markets are getting free delivery through Grubhub to close out the tournament. The deal: Guess what? Free delivery? Guess where? Select markets and through Grubhub. You were all over it. The deal: In honor of the sweet 16, you can take 16% off any single item from the homebrewing hub with the code "SIXTEEN." The deal: Celebrate the end of March Madness with $2 domestic beers and $3 craft beer. You'll have to get some food to get the discount, though. The deal: To celebrate its new delivery partnership with DoorDash, Taco Cabana is offering free delivery. The deal: Every Monday, DD Perks members can grab a free order of hashbrowns when they order a medium or large beverage through the company's On-The-Go Mobile Ordering. Add the hash browns to your cart before ordering. The deal: Rewards members can jump into the restaurant's bracket contest to win Reward Dollars. The first-place winner will get $250 in reward dollars, second place gets $100, and third gets $50. The deal: The deep dish pizza hub is hosting a wing bracket. Vote for your favorite wings and you'll get a coupon in your inbox for 20% off your next order. The deal: Throughout the tournament, you can get a free eight-ounce latte with the purchase of any sandwich, pie, or pastry at the drive-thru window from 7-9am. Alternatively, you can order inside and get a free eight-ounce coffee with the purchase of a slice of pie or cake all day.